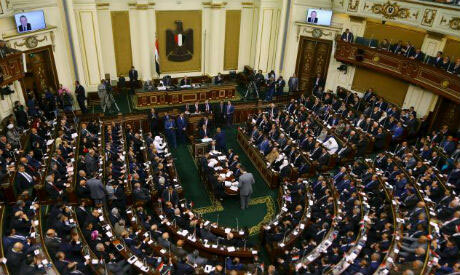 A statement issued by Egypt’s parliament has “strongly condemned” a decision taken by the European Parliament on 13 December, accusing it of interfering in the internal affairs of Egypt. The EU decision “used unreliable reports and politicised and biased sources to deal with some aspects of the situation of human rights in Egypt,” said the statement by Egypt’s House of Representatives. On 14 December, the European Parliament issued a decision which criticised what it called “the violations and discriminatory practices of the blockading countries against Qatari citizens,” which also included calling on the Egyptian authorities to release Qatari citizens Ola El-Qaradawi and her husband, who were arrested without charge. In a meeting held by the Egypt parliament’s human rights committee on Saturday, chairman Alaa Abed said Ola El-Qaradawi and her husband were arrested in June 2017 under permission from the general prosecution. “Both El-Qaradawi and her husband face charges of funding terrorism,” said Abed. Wael Abu Eita, a representative of the Ministry of Justice, told the committee that Ola El-Qaradawi, the daughter of Islamist cleric Youssef El-Qaradawi, and her Egyptian husband were arrested upon the approval of the Supreme State Security Prosecution in case no.316/2017 and that both face charges of funding terrorism and cooperating with the terrorist group the Muslim Brotherhood. “The Europeans should understand that the prosecution-general is an independent entity and not a part of the government, as they always like to show,” said Nasreddin. Nasreddin indicated that Egypt’s Ministry of Foreign Affairs is not obliged to send a written answer to the European Parliament or any other European institutions on the situation of human rights in Egypt.